Hexagon Comics: The First 70 Years! Established in 1950, Hexagon Comics is France’s oldest comics publisher, with a universe of characters as diverse and varied as Marvel’s or DC’s. 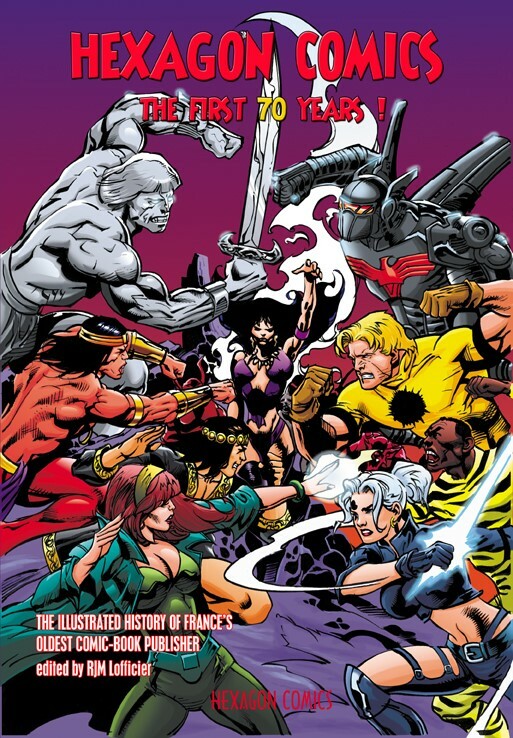 This profusely illustrated 300-page history, assembled and edited by RJM Lofficier, includes articles by Stan Lee, Will Eisner, Joe Kubert, Roy Thomas and Mike Baron, ten comics stories, four prose stories by America’s best pulp authors, illustrations by Paul Pope, Stan Sakai, Steve Rude, Steve Bissette, Jean-Claude Forest and dozens of the world’s best comic artists, interviews, biographies, characters’ profiles, a text that traces the history of Hexagon, from its first publication in 1950, and more. HEXAGON COMICS: THE FIRST 70 YEARS is “a discovery of unsung European comic books, heretofore unseen by American readers” (Will Eisner), and an “eye-filling collection of some of the best series that Hexagon produced during its long and lustrous history” (Stan Lee), not to be missed by any true comic-book aficionado. COMICS STORIES: BATHY-09 (RJM LOFFICIER/ALFONSO RUIZ), DOUG MALONE & MALINBORNE (RJM LOFFICIER/JUAN RONCAGLIOLO), KABUR (RJM LOFFICIER/DAVID LAFUENTE), MORGANE (RJM LOFFICIER/MANUEL MARTIN PENICHE), OZARK (JM LAINÉ/JM ARDEN/REED MAN), THE PARTISANS (RJM LOFFICIER/MARIO GUEVARA), PHENIX (RJM LOFFICIER/FERNANDO PASARIN), RAKAR (RJM LOFFICIER/ROBERTO CASTRO), STARCYB (RJM LOFFICIER/MANUEL MARTIN PENICHE), WAMPUS (FRANCO FRESCURA/LUCIANO BERNASCONI), ZEMBLA (JIM DANDY/FRANCO ONETA). PROSE STORIES: GALOR & ANTONIN (TRAVIS HILTZ), JED PUMA (MATTHEW BAUGH), STORMSHADOW (FRANK SCHILDINER), THE TIME BRIGADE (CLAUDE J. LEGRAND). ILLUSTRATIONS BY JM ARDEN, LUCIANO BERNASCONI, ALESSANDRO BIFFIGNANDI, STEPHEN R. BISSETTE, ONOFRIO BRAMANTE, ALEXIS BRICLOT, LINA BUFFOLENTE, ANNIBALE CASABIANCA, ROBERTO CASTRO, DOMINIQUE CEBE, VINCENZO CHIOMENTI, LEONE CIMPELLIN, MARIO CUBBINO, MARIANO DE LA TORRE, MARCELLO DI CHIARRA, JJ DZIALOWSKI, SERGIO FERNANDEZ DAVILA, JEAN-CLAUDE FOREST, GERALD FORTON, JEAN FRISANO, EDUARDO GARCIA, MANUEL GARCIA, CHRISTIAN GOSSETT, TIMOTHY J. GREEN II, DANILO GROSSI, MARIO GUEVARA, LADRÖNN, MAURO LIRUSSI, ALFREDO MACALL, CHRIS MALGRAIN, ALESSO MARIANI, MANUEL MARTIN PENICHE, GABRIEL MAYORGA, JEAN-YVES MITTON, YVES MONDET, FRANCO ONETA, CHRISTOPHE OUVRARD, FRANCO PALUDETTI, RAFFAELE PAPARELLA, IVO PAVONE, STEPHANE & OLIVER PERU, PAUL POPE, LUCA POZZA, EDMOND RIPOLL, JUAN RONCAGLIOLO, STEPHANE ROUX, STEVE RUDE,ALFONSO RUIZ, JOSE LUIS RUIZ PEREZ, STAN SAKAI, JAY STEPHENS, RAUL TREVINO, GIORGIO TREVISAN, EMILIO UBERTI. NESTOR VARGAS, GUIDO ZAMPERONI. INTERVIEWS WITH LUCIANO BERNASCONI, JJ DZIALOWSKI, JM LAINÉ, ALFREDO MACALL, MANUEL MARTIN PENICHE, FRANCO ONETA, IVO PAVONE, GIORGIO TREVISAN. BIOS OF LUCIANO BERNASCONI, ALESSANDRO BIFFIGANDI, ONOFRIO BRAMANTE, LINA BUFFOLENTE, ANNIBALE CASABIANCA, CARLO CEDRONI, VINCENZO CHIOMENTI, LEONE CIMPELLIN, MARIO CUBBINO, DANILO GROSSI, CLAUDE J. LEGRAND, JM LOFFICIER, YVES MONDET, THIERRY MORNET, FRANCO & FAUSTO ONETA, FRANCO PALUDETTI, RAFFAELE PAPARELLA, IVO PAVONE, GIORGIO TREVISAN, EMILIO UBERTI, GUIDO ZAMPERONI. ARTICLES BY MIKE BARON, ERIC BOISSAU, MATTHEW DENNION, WILL EISNER, JM LAINÉ, PATRICE LESPARRE, JOE KUBERT, STAN LEE, RJM LOFFICIER, THIERRY MORNET, MICHEL PAGEL, FRANK SCHILDINER, ERIC STOFFEL, ROY THOMAS. FOCUS ON THE GUARDIAN OF THE REPUBLIC, KABUR, PHENIX, STARLOCK, STRANGERS, WAMPUS, ZEMBLA, NEW HEROES, TEENAGE HEROES, UNDERWATER HEROES. Scroll: Jean-Claude Claeys, Christine Clavel, Ladronn, Nathalie Lial, Stephan Martiniere, Jean-Pierre Normand. Anne-Claire Payet, Jean-Michel Ponzio, Adam Tredowski, Yoz. © 2019 Copyright HollywoodComics.com, LLC. All Rights Reserved.